We spent most of the girls' spring break at home. The weather was beautiful, most of the time, and there were playdates and sleepovers and dance classes and a Richard III read-through to keep us busy. Thursday, however, was special. Because Mr. B was off work that day, and there was nothing else on the schedule, we spent Thursday exploring a bit of our state we'd never seen. 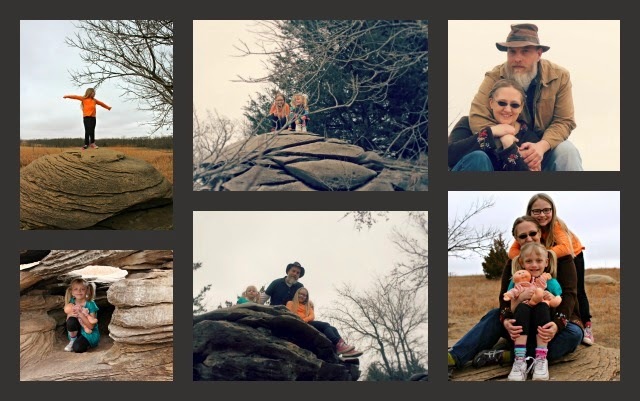 We did something similar two years ago, when we headed up to Wamego for the Oz Museum, and came home via the Flint Hills Scenic Byway. This new trip was one we wanted to make last year, but sickness prevented us from having much fun. We left Wichita at about 10 AM and basically, headed to Lindsborg, although this time we only drove through a tiny section of town. It was a chilly, rainy day - of course, our one not-so-nice day fell on our day trip day. 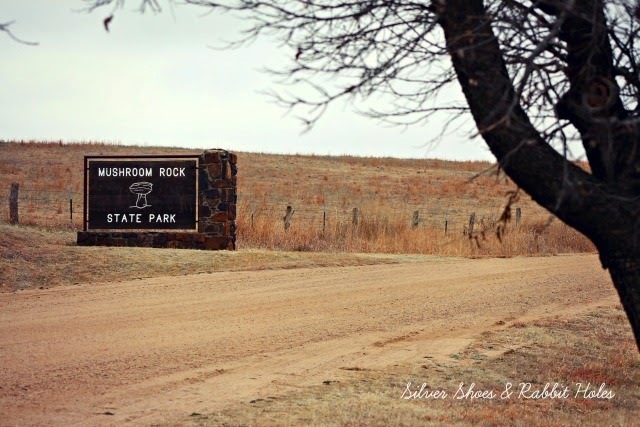 Our first destination was Mushroom Rock State Park in Ellsworth County, one of the tiniest state parks in the country. Yeah. These rocks were pretty awesome. 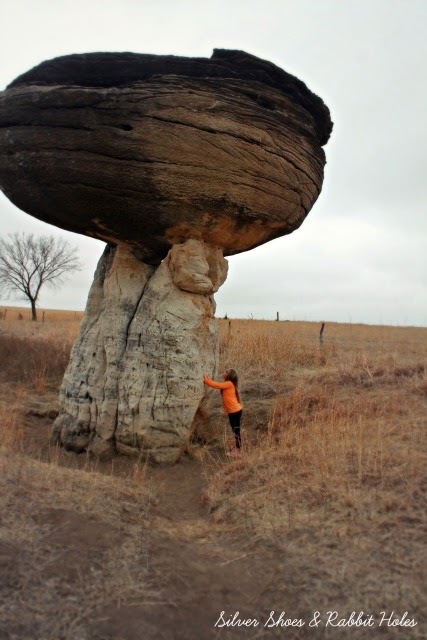 Mushroom Rock (there are two of these giant puppies) is a series of sandstone rock concretions. 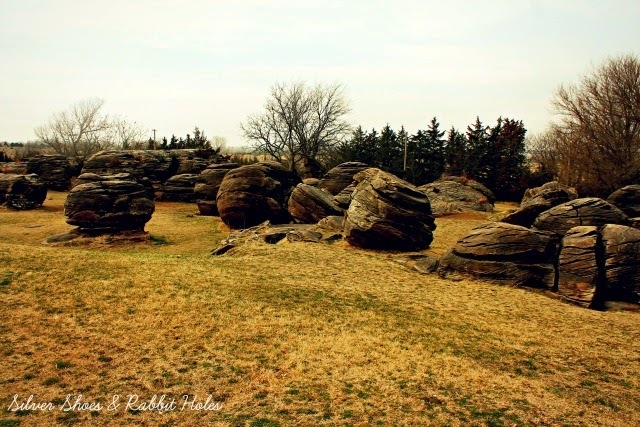 To quote the Kansas Sampler Foundation: "The strangely shaped rocks at Mushroom Rock State Park are made of sandstone from the Dakota Formation, deposited along the edge of a Cretaceous sea about 100 million years ago. Over time, circulating water deposited a limey cement between the sand grains, creating harder bodies of sandstone called concretions." 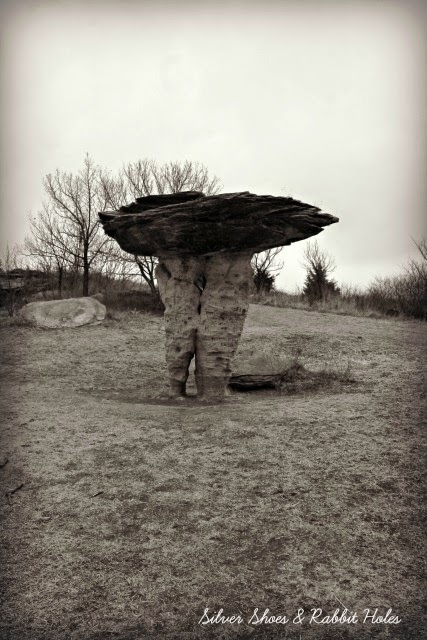 The two giant mushroom-shaped formations were formed as the bodies eroded over time. I couldn't get a good picture of it, but Mr. B pointed out how the smaller rocks were located all along the side of the road, beyond the park, in the brush and grasses. 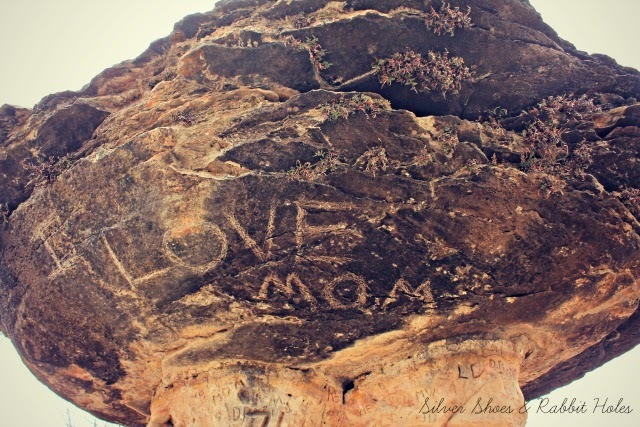 Over many, many years, people have carved names and dates and other things into the rocks. 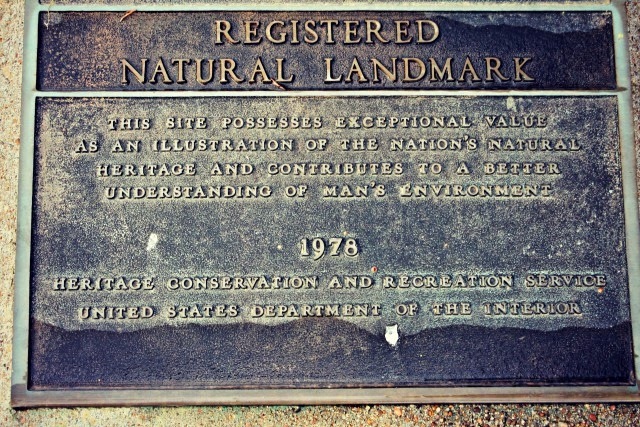 I'm sure it isn't great for the rocks, but it is an interesting time capsule. There are some great historical pictures at KansasTravel.org. I guess to reach the top of the big rocks, a ladder would need to be used. I read where people pull their car beneath the two-stemmed rock, but we'd need another grown-up for a good family picture! 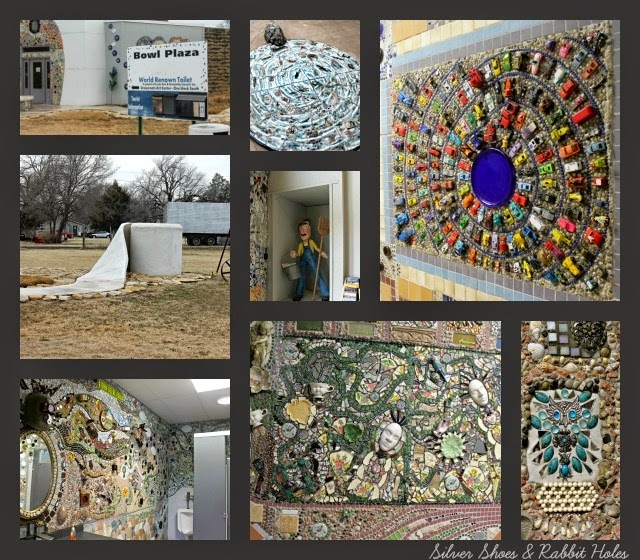 Lucas is the "Grassroots Arts Capital of Kansas." 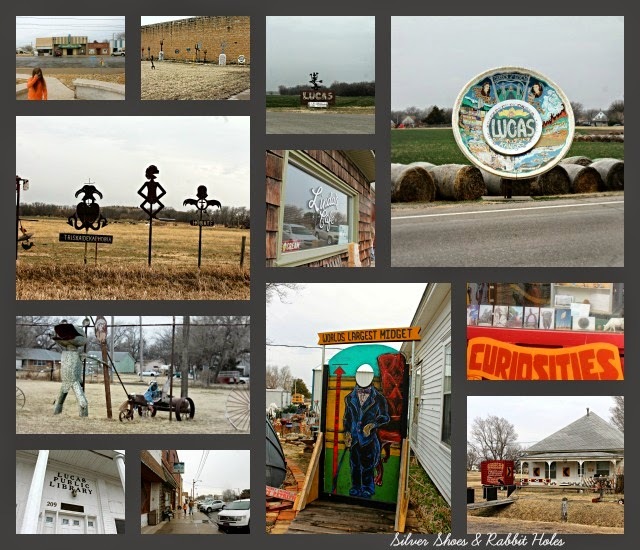 You're greeted as you enter town by the World's Largest Souvenir Plate. There is strange and interesting art everywhere. We visited the World's Largest Collection of the World's Smallest Versions of the World's Largest Things, but missed seeing Florence Deeble's Rock Garden. Our top two destinations, however, were S.P. Dinsmoor's The Garden of Eden, and the Grassroots Art Center. When The Garden of Eden came into view, I literally gasped. I'd seen pictures, but it's so wild to see this place in person. I didn't know anything about it until I was in my early twenties, working at the bookstore. The first Weird U.S.A. book had just been released, and one of my co-workers showed me its entry. It's a very unusual place, built by a very unusual man. S.P. Dinsmoor was a Civil War veteran who came to Lucas, Kansas, in the 1880s. He was a farmer, and moved into town upon retirement. 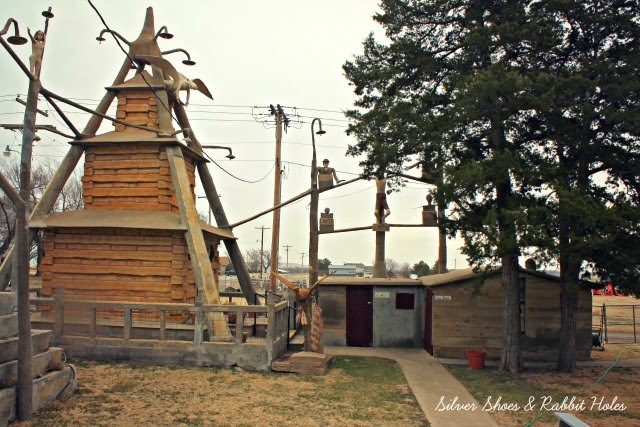 He wanted to build a cabin, but Kansas is not exactly known for its trees. Instead, he used post rock limestone, quarried to unusually long lengths, then built the house the way one would construct a log cabin. 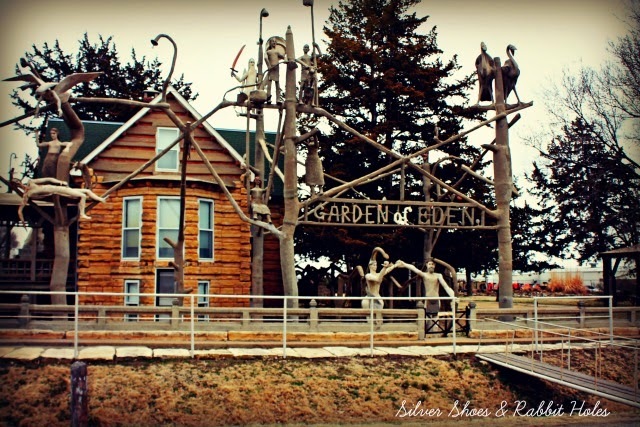 He was 64 when he began construction in 1904. Dinsmoor was a religious man, but against the organized church. He was a Freemason, and very involved in the Populist Movement. 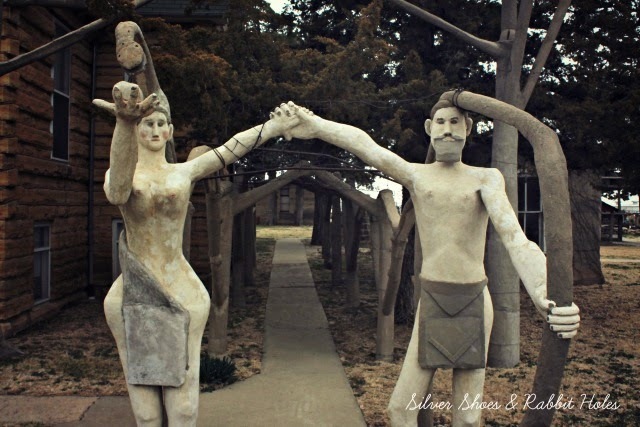 He began to carve a series of sculptures out of concrete. 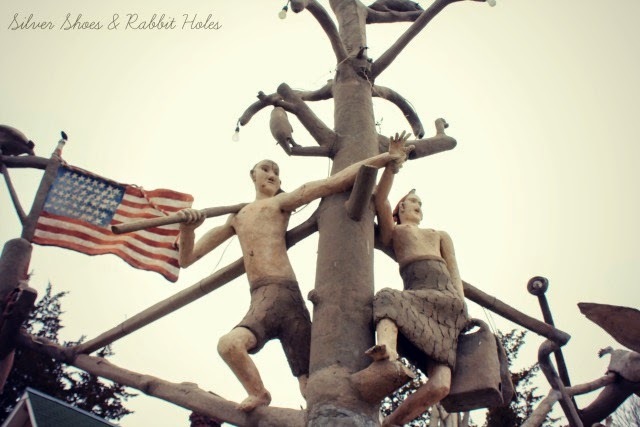 There are religious sculptures, beginning near the "Garden of Eden" sign, depicting Adam and Eve, Cain and Abel, and such. Then as you head around toward the museum's entrance, the political sculptures appear. His big theme is monopolies and white collar types, often represented by an octopus, stealing from the little guy. 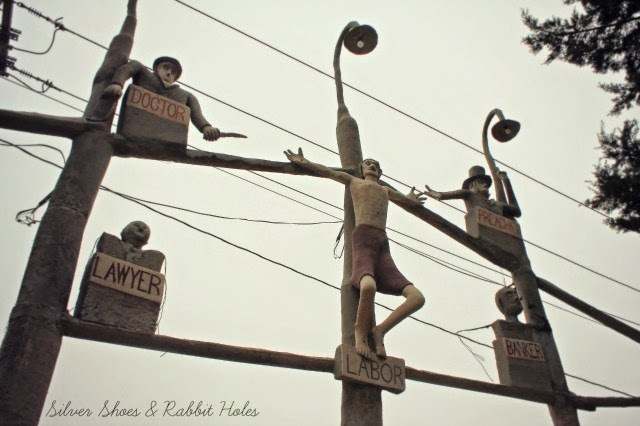 Dinsmoor built his home and sculpture garden to tell a story, yes, but also to earn a living. The place was always intended to be a showpiece, and he gave tours and charged admission for income. He built a mausoleum in the back, complete with concrete coffin. Our tour guide was actually a descendant of his second wife, and provided lots of fun details. She said that admission might be a dollar, but for an extra 25 cents, he'd pose in his coffin for visitors! When his first wife died, he wanted to inter her in his mausoleum, but the city said no. After she was buried in the local cemetery, Dinsmoor and friends dug her up and after parading her coffin through town, Dinsmoor lay her in the mausoleum, then enclosed her coffin in concrete! While the sculptures may give off a creepy vibe, they're nothing compared to the mausoleum. Dinsmoor was mummified after his death, according to his wishes, and laid to rest in the mausoleum, in his concrete coffin, behind glass. [His first wife is encased in the concrete beneath him] And yes, you can see him! Little Sis ran to be the first one in, by the way. Big Sis chose not to see. Our tour guide told us the glass broke about a dozen years ago, and mold and dampness have finally started to take its toll. He is decaying, although he still has a beard. She told us she could remember when you could still see skin! Mr. B and I loved our tour of Dinsmoor's Garden of Eden, and the girls were entertained. Our guide, being family, had some great stories to tell and the place didn't feel creepy at all. Dinsmoor came across as a funny eccentric. 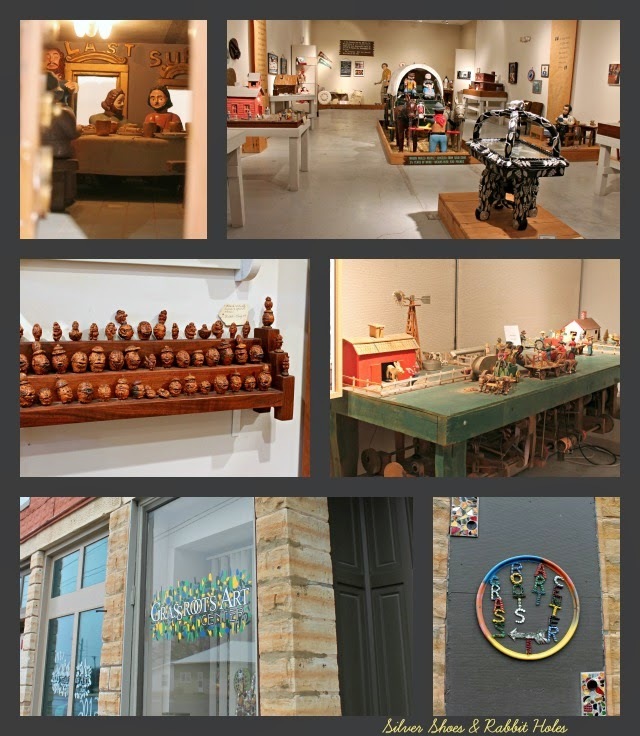 Also worth the trip was a visit to the Grassroots Art Center on Main Street. 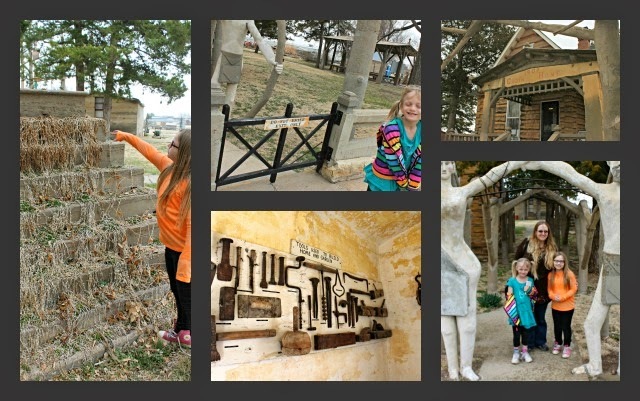 We opted for the guided tour around the little museum, as we were shown all kinds of strange art: hard limestone sculptures, stuff made from pull tabs and peach pits and beach trash, a mechanized farm scene, mosaics, all kinds of things. We grabbed a quick bite to eat, then stopped at Bowl Plaza, the most interesting public restrooms I have ever seen in my life. In fact, it was voted the Second Best Restroom in the United States. Yes, the sidewalk is toilet paper - see the roll? The men's has cars and toys on the walls, while the women's has masks and tea cups and owls and shells. 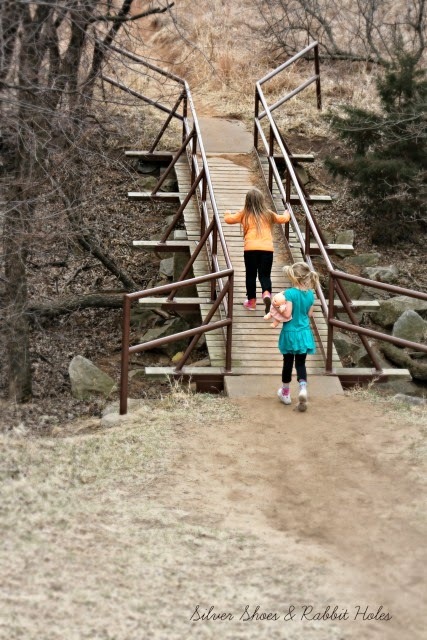 When we left Lucas, we headed east, then north a bit, to Rock City Park, near Minneapolis, KS. We began the day with huge prehistoric rock formations. Might as well end the trip the same way! 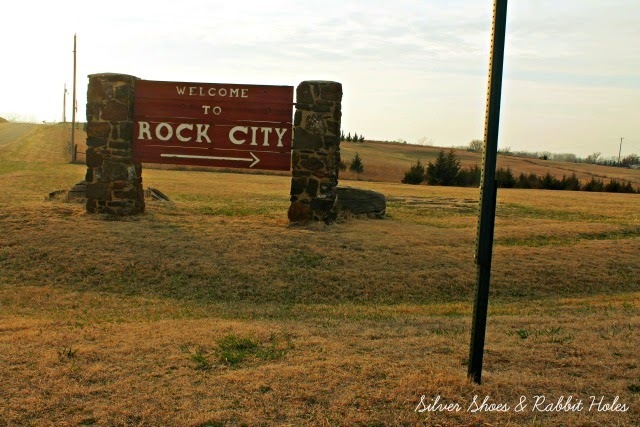 Rock City (not to be confused with the awesome Rock City of "See Rock City" sign fame) is a larger collection of the giant sandstone concretions, although none of them have the weathered "mushroom" look. The park has a small gift shop, where you pay admission. I'd love to know what they sell in the shop, but it was closed. There's a little collection box for after-hours admissions, and we're honest people. We paid. 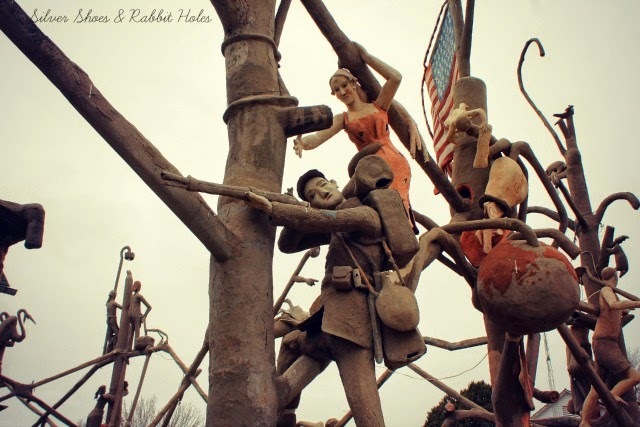 You can read a nice interview with a man behind the cash register on Roadside America and KansasTravel.org has more historical photos. As you can see, the sun had finally decided to break through. 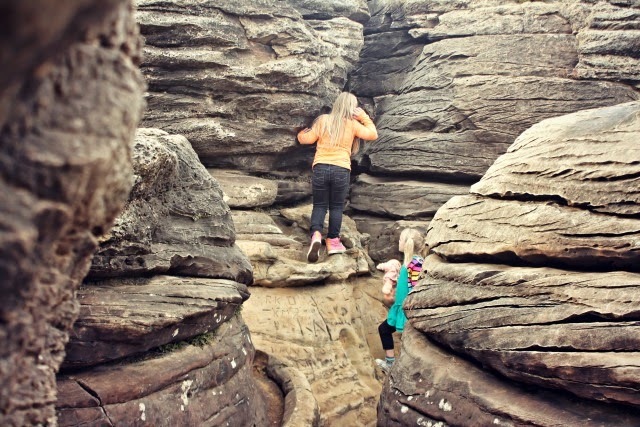 The girls decided they like Lucas and all the art, but climbing rocks was the best part of the whole day. There was more to climb at Rock City, but they told me they preferred the smaller Mushroom Rock State Park. 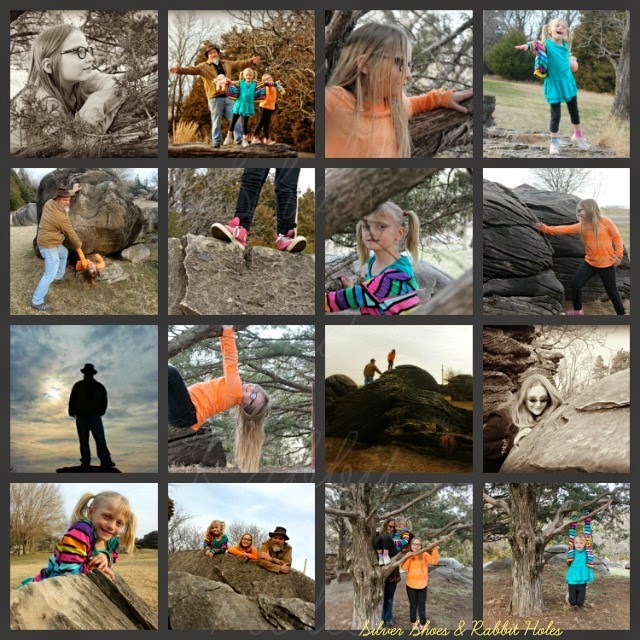 By the way, one of my jobs as mommy/photographer was to snap pictures of my Little Sis's old Cabbage Patch Kid preemie, Lotta Gabie, as she "climbed rocks and trees." 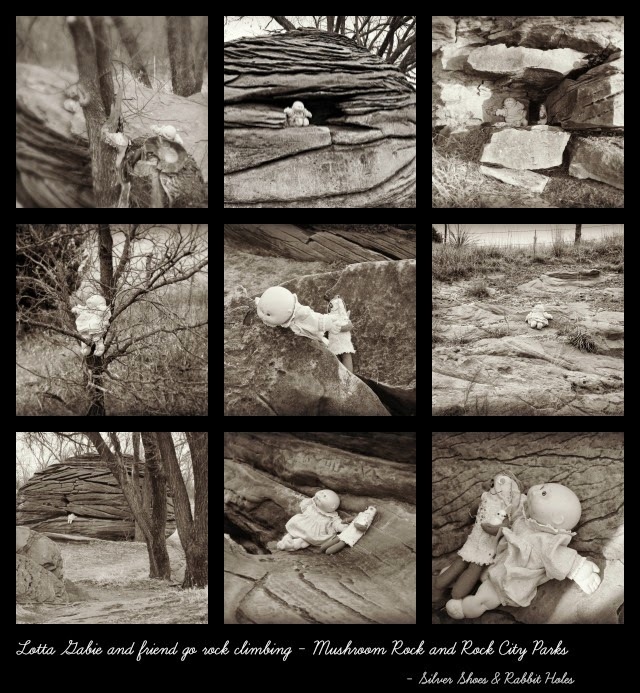 She was joined in Rock City by the weird little zombie art doll Little Sis bought with leftover Christmas money at the Grassroots Art Center. I should add that I planned this trip by using several websites, including Kansas Sampler Foundation. 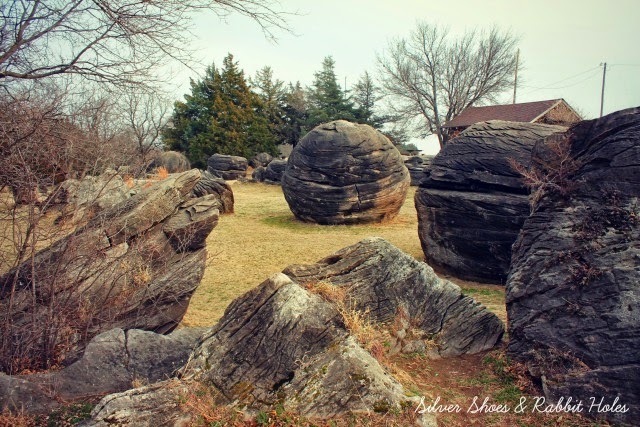 Both rock parks and the Garden of Eden made their categories in the book The 8 Wonders of Kansas by Marci Penner, put out by the Kansas Sampler Foundation. I don't own a copy (yet), but I've checked it out from the library and loved it. Kansas doesn't have a lot of flash to it. We don't have grand mountains or forests, natural lakes or beaches, and there can be plenty to complain about. But it's home, and sometimes, you just gotta go looking for things to appreciate. Find that beauty, that something special or quirky or fun, and enjoy it, right? SO MUCH AWESOME. 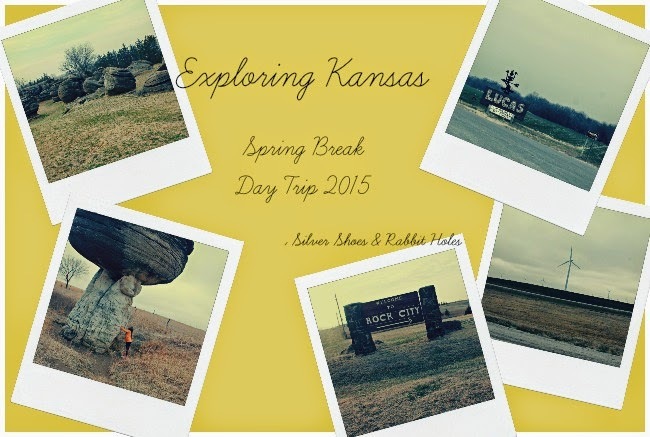 I swear, I think now that Kansas is the most fascinating place on earth and that's 100% because of your blog!! I love how you guys get OUT and DO and SEE things! We're terrible at that and now that we have the dog, blurgh...even less road trip potential. I can't believe that bathroom! Love those rocks! I'll come do your family photo someday! Love the cabbage patch baby pix! I feel like I came along on your trip, thank you! Thank you so much. We try! You know, my mom lived in Georgia, northwest of Atlanta, in the foothills of the Blue Ridge Mountains. I'd stay with her most spring breaks and for at least a month over the summer, all through college. There were so many cool things to do within easy driving distance: Chattanooga and Lookout Mountain (the other Rock City, mentioned above), Savannah (about 5 hours away), Nashville (2 or 3 hours away), Gatlinburg (a little farther than Nashville), plus all the stuff that was closer: Dahlonega (cool mountain town) and Helen (German town in the Georgia mountains), Atlanta itself (Coca-Cola Museum, the Underground, etc.). Even little Cleveland had Babyland General Hospital, original home of the Cabbage Patch Kids. 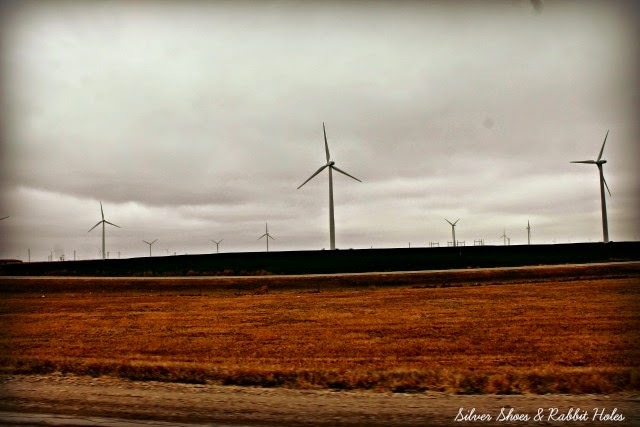 I loved to go visit because I love road trips and scenery and old houses and buildings and doing stuff. I've managed to get Mr. B, a homebody at heart, onto my wavelength. I want to see everything! Big Sis is like me. Little Sis is more like her dad, but she's starting to come around. I want to explore the Pacific Northwest someday. The states west of Kansas that I've visited are Colorado, New Mexico, and Arizona. I need to see more! This looks so fun! I want to go on vacation with you!! Oh gosh! You're always posting such fun things to do. We have been to DC a couple of times to visit my brother-in-law and his husband, and try to fit in as much as possible. So much fun stuff.